Our position is based on this enduring principle: It is impossible to achieve democratic change except through democratic means. Putin added that he stood by Turkish democracy as a matter of principle, and the same principle applies to Syria. In other words, there cannot be a political solution in Syria that does not go through the Syrian people. The Turkish president, who wanted the world to support democracy against an attempted violent takeover, cannot ask his Russian counterpart to overthrow the president of Syria, and remain consistent. He could argue that Assad’s handling of the protest movement may have reduced his standing among the Syrian people, but only a fair and transparent elections can validate that claim. Erdogan, can find common ground with his Russian counterpart if he were to give the Syrian people the same right he has given the Turkish people: the right to vote without outside interference. 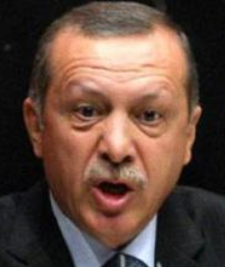 All Salafist groups that Turkey is supporting to oust Assad do not believe in democracy as a matter of faith. He either shares their belief in democracy being “un-Islamic” or he is inconsistent. If he has concerns that Assad may not hold fair elections, he should ask his Russian “friend” to give his assurances that elections would meet certain standards. But he cannot predetermine its outcome through a violent overthrow or an outside-imposed exclusion of Assad. Erdogan must choose between democratic processes decided by the Syrian people or violent takeovers. It is that simple, really.